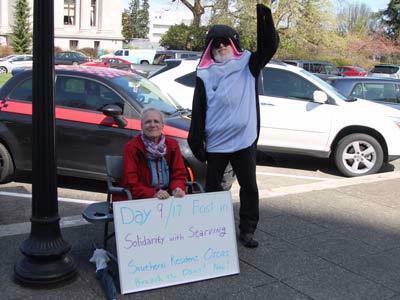 OLYMPIA — Lanni Johnson is a 71-year-old woman who has been sitting in front of the Capitol Building in Olympia for the past 9 days on a hunger strike. Johnson says that the government is taking too long to solve the problem of declining flood supply for the southern resident orcas. “I’m here because I believe that while we twiddle our fingers and push a lot of paper around and have many many meetings, we are going to watch the southern resident orca go extinct,” said Johnson. Johnson cited scientists who say the southern resident orcas need an increase food supply over the next four years or they will go extinct. “I mean the things that the orca task force wants to do, they’re very important, and they’re very good, and we need to do them all, but they’ll be too late,” said Johnson. Johnson plans to continue her strike for the next 8 days, bringing the total up to 17 days, which is the same amount of time that Tahlequah, a mother orca, carried her dead calf in July 2018. The calf was the first to be born alive since 2015 and lived for less than an hour. National media outlets picked up the story and followed Tahlequah as she carried her calf around the Puget Sound region. With all of this attention on the southern resident orcas, the Washington legislature created an Orca Task Force in March 2018. Johnson is tired of being ignored, which she says is one of the reasons she decided to start her hunger strike. After not eating for 9 days, Johnson is feeling weak and having trouble remembering what she’s doing or why she went somewhere. Johnson did consult her doctor before beginning her protest. This is the first major thing that Johnson has done when it comes to political activism. Johnson has been so focused on this event that she has yet to consider her next steps when it comes to next steps on this issue. Johnson has lived in Snohomish for almost 40 years and has three sons. Before she retired, Johnson was a technical troubleshooter for a tech company. Johnson and fellow supporters plan to hold an event on the steps of the Capitol in Olympia on Friday, where they will have “ghost fins” representing the 53 orcas that have died since 2005.